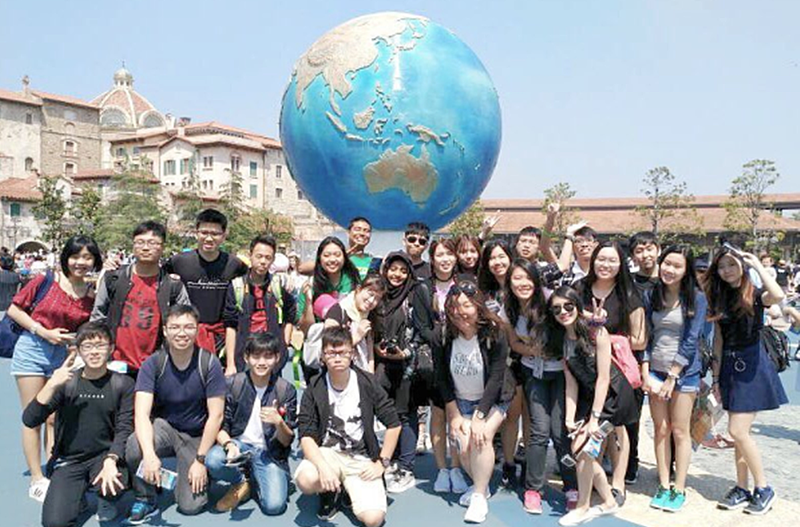 GOH EUNICE: UTAR Study Tour in Soka University, Tokyo. Since Soka University is in Hachioji, Tokyo, I will write mostly about the places we traveled as a student around the vicinity of Hachioji. It is a rather quiet and a rural area. It was so calm, so cold (cos of the weather haha) and it was extremely peaceful. You don't see tourists wandering around here at all. The university was also about a 20 minute bus ride away from the KEIO Hachioji train station. So, you can imagine how quiet the place is. I loved it there. I flew with Japan Airlines for the first time in my life! I think I also have to mention that this is my first time in Japan!! I was beyond excited, I couldn't believe it, even during the night before the flight. It was just after finals, I had to rush in packing my entire luggage, which really wasn't an easy task for me. I had to think everything through from what to bring and what not to bring because I'd be living off that luggage bag for the next half a month! I went through several checklists with Euwern and a few other friends just to be extremely sure I wasn't missing out on anything. Hold up, speaking of Euwern, YES, YOU HEARD IT! I went on this Japan Study Tour with my sister!!!!! At the age of 23, this is also the first time I am travelling overseas for such a long duration. It didn't even come across my mind at all on whether I'd be missing Malaysia or not. But at that point in time, I just couldn't wait to leave the country! Hehe. It was a 7 hour plane ride, we safely arrived Narita Airport early in the morning! Be prepared for the major language barrier! We were greeted at the airport by Ms Yuny, one of the staffs of the international affairs department at Soka University. A bus came to pick the lot of us (26 of us) up and head on to the university. Everything was so surreal. As soon as we got up the bus, Ms Yuny gave us each a card with our student ID number, username and password which turned out to be the password to the university as well as the dormitory Wi-Fi. Nope, this is not our student card, we'll be getting one later. I slept the entire way to our destination. So, there it is. We have arrived 創価大学! Before the bus stopped, I peeped out the window and saw this small little truck waiting for us. The uncle standing on the back of the truck was actually the manager of our girls dorm. His name is Toshicchan and he is a very sweet, gentle and kind man. The truck was to be loaded with our luggage to be brought to the dorm. How sweet wtf don't have to tug or pull or carry or complain about the entire journey to our dorm! Which gives us only more time to admire whatever we could feast our eyes on first! This is one of the 3 entrance gates of the campus. My memory is a little fuzzy here but I'm pretty sure this is called Eiko Gate (栄光門 - Eikomon). There is a meaning behind every name given, every painting hung, every street and every monument built in the campus. There is a meaning to everything! Eiko means glory(?) and mon is the gate. So, it's like the gate of glory hahahahaha. It sounds very funny but I'm not joking. Anyway, there is also a bus stop just after the gate which is where we begin our Tokyo discovering journey on days we don't have classes. This is our (the girls) walking journey to our dorm. We wake up at 7am every morning, walk up this slope which usually takes about 10 minutes(?) just to get to class. I had no complaints lah because the weather was amazing (ahem, for a few days). Speaking of walking, we walked A LOT. I think its just us Malaysians. We're so not used to public transports and walking because everyone of us has a car and we drive EVERYWHERE. We drive even though its a mere 500m distance. So, for the first few days of our trip in Japan, I was literally massaging my feet every night until I eventually got used to the pain. Anyway, so we're walking to our dorm! Ta-daaaa! Here it is! Ryukufu dormitory also known as The Girls Dorm! Here's the lady boss of the dorm wiping each and every one of the wheels of our luggage bags. There were 12 of us girls and some of us had 2 luggage bags each! She wiped all 4 wheels! She is Michan and she is also a very sweet and chirpy lady. We felt so warm and welcomed every time she smiled at us. Mandatory house slippers! Although throughout my stay there, the slippers only gotten smellier and smellier as days passed. I really cannot tahan the smell of my own feet. Too much walking (complaining again hahaha). I have to admit lah... wearing in-house slipper is such a bother. Its so noisy when you walk or run around the place, especially going up and down the stairs. 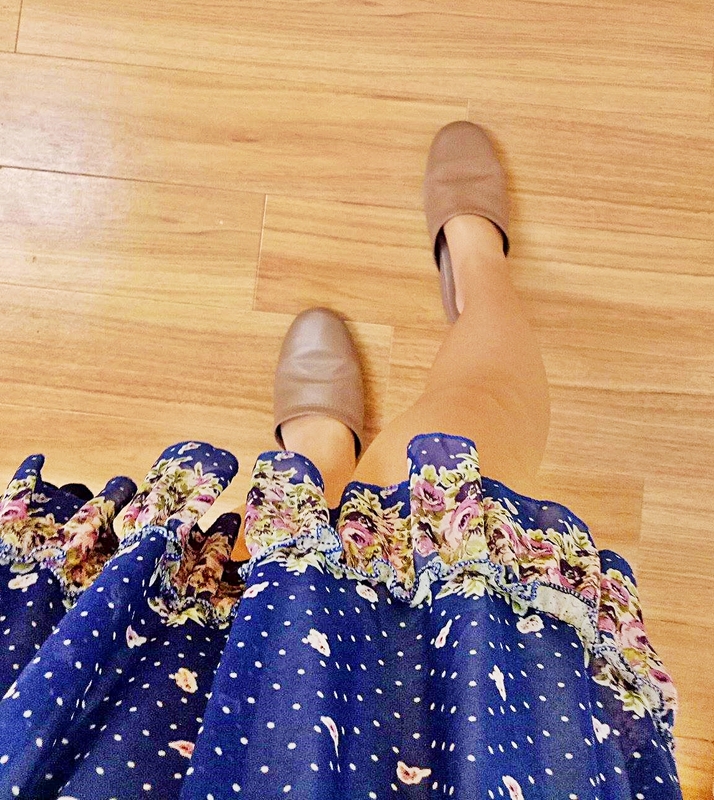 I just want to take it off and walk barefoot most of the time. But, its culture. I'm not too sure whether to consider myself lucky or not cos just outside our room was the sink! Okay, quite a good news for me cos I can see my reflection as soon as I open the door, brushing my teeth and washing my face is not a hassle hahaha cos of the lesser walking distance (complaining again). Oh oh!! This is one very important thing! This is like a check-name list of the people in the dormitory. It has our names as well as room number. See resident assistant? Its Yun Qi! We became close friends (I'll explain why later hahaha) after our 11 day stay in the dorm. 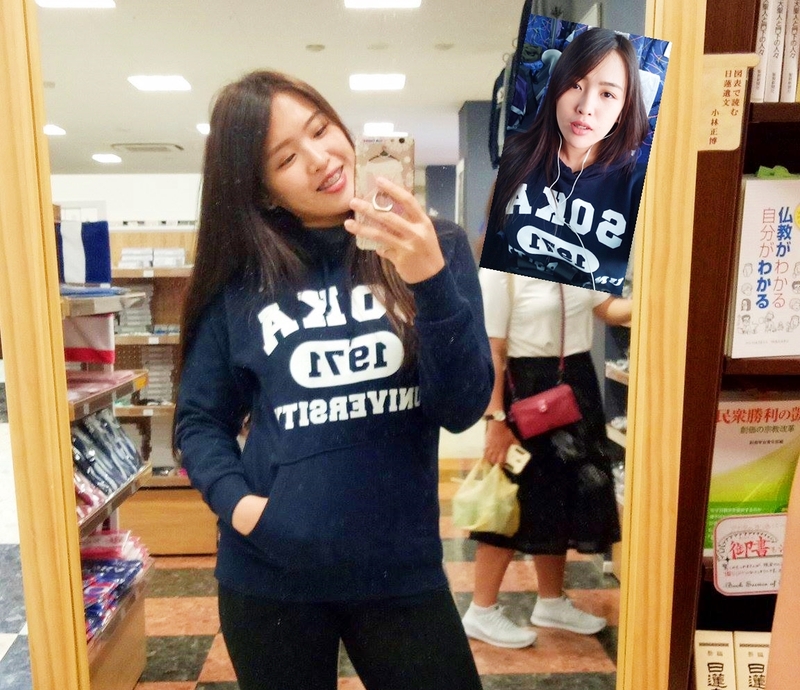 She is a Malaysian doing her degree in Soka University. 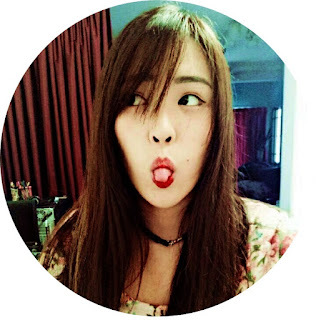 She is really damn 强 pls! She taught us a lot of things and told us a lot of stories about her stay in Japan. We have a curfew of 11pm, which means we cannot stay out late. Every time we go in and out of the dorm, we have to change the magnet on the board to let people know whether we're around or not. During the first couple days there in Japan, we didn't really know what to say every time the sweet lady boss says 'Itterasshai いってらっしゃい' to us. It was super awkward. Finally, Yun Qi told us that we have to reply with 'Ittekimasu いってきます' every time we leave the house and reply to their 'Okaerinasai おかえりなさい' with 'Tadaima ただいま' every time we come home. At the beginning of our stay, everything was awkward because we couldn't really converse with the couple (the aunty and uncle). It was horrible. But omg you wouldn't believe this! At the end of our stay, we were able to talk to them casually. I was so 感动! But anyway, more of that later hahaha. So, that's how the in-and-out magnet buttons work. Huehuehue! Now, this is how all 12 of us unknowingly became close friends! This is a place where secrets fly. We only had this shared bath house (?) in the dorm. Meaning, there is no individual bathrooms hahaha. On the first day of our stay, we were still not familiar with each other. But starting from the second day of our stay... BOOM. Our shower session has miraculously brought us together. It's crazy because Malaysians girls just don't shower with their friends on a daily basis. Moreover, we literally just met. But I guess it was something we just had to get used to since it was a culture over there. We would shower, bathe while (very) loudly summarizing our day at the same time gossiping about the guys. It was an experience you'd never be able to gain back in Malaysia. Aside from that, there were little stools and buckets to use when you take a shower. I have NEVER sat down and shower before! It was weird but it eventually felt right. You know? Why should you stand and shower when you can sit??? The shower was amazing, the water was so hot! The onsen was even more amazing! Also an extension of our haven because sometimes we eat and drink hahaha. This is the dining area. 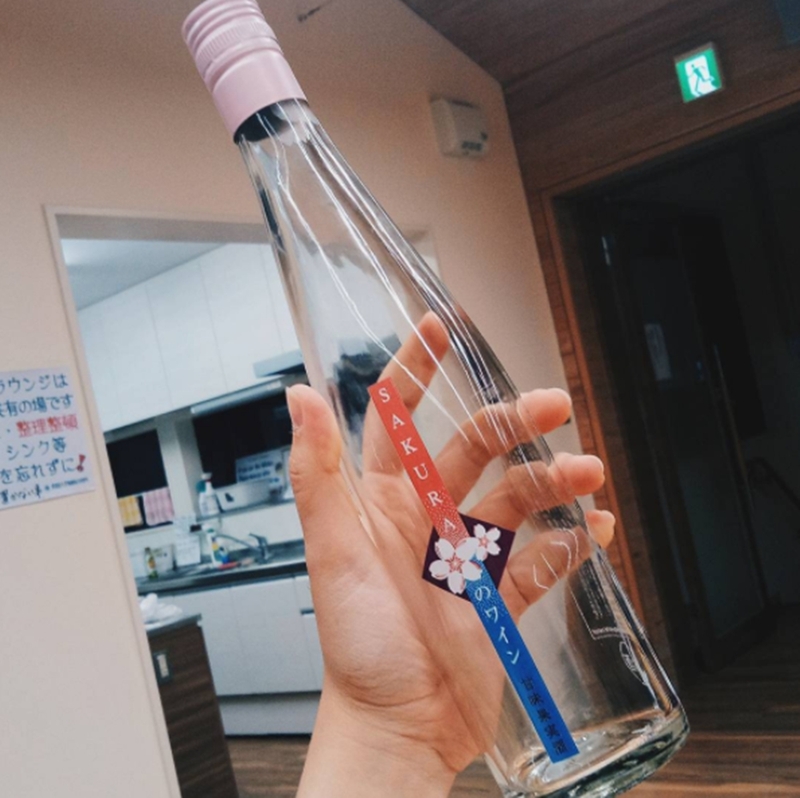 This is one of the things we drink during our midnight pillow talk sessions; Sakura wine! I feel like this is a mandatory mirror at the entrance of any Japanese house. Anyway, so that's the end of our dorm tour! We haven't even get to the university tour yet and this post is already running so darn long. Bear with me, I'm doing my best! These are all great memories and I don't want to miss out on anything! After our dorm tour, Ms Yuny walked us to the nearby 7-Eleven, which ended up turning into our favorite (next to Lawson and Family Mart) place in the world. It was a short walk down the slope but a long one back up urghh. But still, the weather was great! This morning view is to die for. I don't even want to get up, really. That's about it for the first day. We didn't do much. 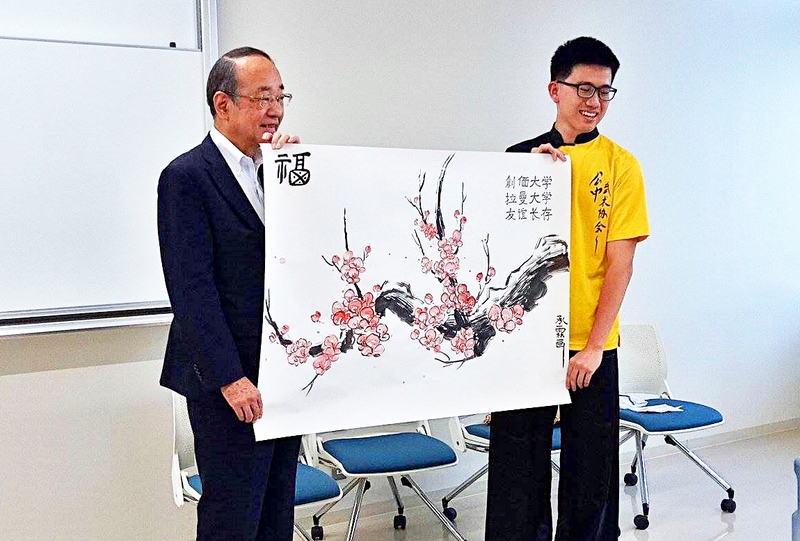 But we had an orientation as well as a welcoming party from the staffs and students of Soka university the next day. So, that means we had to wake up early. It was our first morning waking up in Ryukufu Dorm, first morning getting ready to go to school together and first day walking to school together. Honestly, I'm kinda sad for Euwern cos she didn't get to wake up with this view every morning (she was facing the other side). I hogged it all to myself. Even Wynne loved the morning sun and view. Speaking of which, the sun rises at 4am. WHAT. It was so bright so late at night! But still, no complains. Can you feel the warmth of my futon?! We spent the early morning looking for directions to our orientation class and taking group photos. This, my friends, is our next favourite place. New Loire, one of the five cafeteria/eatery that exists in the campus. But this is number one on all of our list. Do you want to know why is that so??? It looks like an ordinary cafeteria. This is a meal ticketing corner. It's basically a vending machine for tickets. Do you want to know what's so special about this place and the food here? Every morning at 8am, meal tickets will begin to go on sale. But here's the thing, only the first 100 students that buys the meal tickets get the buy a set meal for only 100 yen. 100 YEN! It's so cheap! And the breakfast they serve every morning is different. Throughout my 11 days there, there were no full-repeat meals. I think its a great idea because we actually wake up earlier just for the cheap food! Otherwise, that 100 yen meal would originally cost about 400-500 yen. Its a good deal. Do I have to mention how full and fluffy Japanese rice are?! I miss the free flow japanese gohan!!! Japanese rice is so expensive back in Malaysia. Here are some photos of our あさごはん for a few days! Natto!!! Without a doubt, I'd definitely wake up at 7am just to have you every morning! You can find vending machines literally in every corner of Japan! Time to spam some photos with humans. From the left its PeiQi, XianYee, Euwern, YiXuan, ME!, Jiajia, YaChing, FangYee, Wynne, Inez and Hae ee! Thank you mini tripod for taking this memorable photo of us back when we still don't know each other that well. On a side note, RIP mini tripod. Recycling is a very めんどくさい thing in Japan. Its so troublesome that sometimes I kinda just want to eat my rubbish, scoff down my plastic wrapper and swallow my plastic bottle. Why do you need so many different recycle bins? And all the bins are in Japanese. I usually just look for the 'combustibles' and throw everything inside. Even back at the dorm, they have a bin for plastic bottles, plastic bottle caps, glass bottles, glass bottle caps, plastic wrappers, milk carton wrappers, different plastics and the two bins everyone knows; combustibles and non-combustibles. Aside from that, you also have to wash your bottles and milk carton wrappers before disposing them. Whuuut. You tell me, mendokusai or not? I'm glad I got to know them and glad I got to experience Japan with them. So, we finally found our orientation class. Apologies if this post is a little messy and jumbled up. I'm doing my best. This was our orientation essentials. We had a map of the campus as well as the train lines and our student ID in the little pocket attached to the lanyard. And on the right is our class schedule. 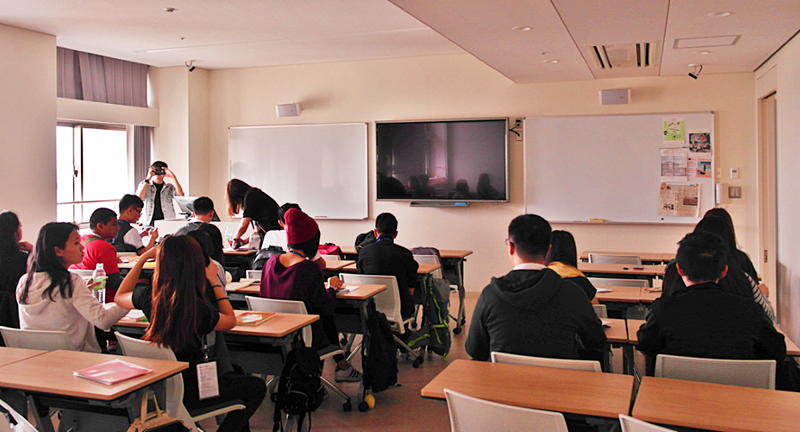 We had Japanese classes during the study tour programme. I conclude that learning Japanese in Japan is so much more efficient compared to learning it in Malaysia. It's only a couple days and I couldn't even believe that I could read all the hiraganas so quickily. Like I mentioned earlier, there was a welcoming party for UTAR students! Out of all the food they served on the table (which was really too much food. All was crazy delicious as well wth), I chose to upload this because it looks the nicest!. What's the name of this building again? After our welcoming party, Ms Yuny and Ms Emily (also a staff from the international affairs department) took all 26 of us on a tour of the campus. It was close to a 2 hour tour on foot. Yes, ON FOOT. As I said earlier, Malaysian's legs aren't meant for walking, they're meant for driving! The campus was so big. All that was running through my head was how was Ms Yuny and Ms Emily walking so far and long IN HEELS?! The reason why the tour took so long was because... remember what I said just now? That there's a special meaning behind EVERY Japanese street name, portrait, monument and building? Yeap. I was proven right here. Ms Yuny and Ms Emily actually explained everything behind everything! There's a story to everything. And what's the name of this bridge? I can't remember the name of this bridge. But I remember Ms Yuny explaining that the two pointy things on top of it represents a student and a teacher. The taller one is the student because... the student will surpass the teacher? I don't know. There were plenty of stories that we great to listen to at the time. I'm just so sad I can't remember them now GG. There's a story about this statue on the left as well. This is the Soka Women's College. This is a funny one that I remember. Ms Emily said that rumour has it that since only girls are allowed in the college, any guys that steps foot into the building or even tries to walk up those stairs, will instantly be expelled from SOKA University. Very funny hahaha. There's a story to this bell. And also a story to this thing. I'm just putting these photos here in case I do remember it one day. All the cherry blossom trees around the campus! I can only imagine how beautiful the place would look if it were to be the right season. Too bad we came a little too late. Better luck next time? I can't name everyone because there are just too many people to be mentioned. I'll just leave it at that. There is an area just for ladies T_T UTAR, PLS GET ONE. I think there are 2 or 3 libraries? Look at the shelf full of CDs and DVDs! Whuut. Nope, you're not mistaken. We're still touring the campus. This is the Student Hall. Okay, I'm done touring the campus. Japanese 101 - Do you even know what you are doing?! 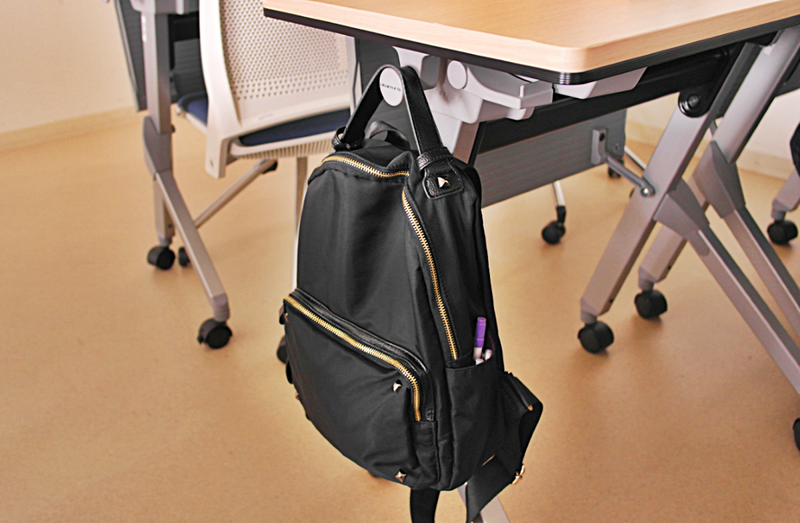 When classes commences, the bell rings. Yes, the bell rings. Just like primary school. They also have recess time which is lunch time. Yes, everyone recess together and yes THE BELL RINGS. Our first Japanese class was taught by Machida sensei. It's a completely different experience when learning Japanese here. The teacher doesn't speak even a word of English. The beginning of everything was really tough because it was a little hard to understand what she was asking or telling us. But she was a really good teacher, she spoke slowly but clearly. She had a lot of facial expressions as well as hand gestures which made everything a little easier. Soon enough, there wasn't that difficult barrier anymore. The classes and activities were all very interactive. We had to talk to each other as well as to roam around the university asking actual students for directions as well as to interview them. The students there were also extremely friendly and patient when listening to us speak our noob japanese asking them noob questions like 'Do you like to eat rice?' wtf hahahhaha. High-tech computer and teaching tools. Although, they are only great for small classes, I guess. Every morning class situation! I learned a lot from this class! Here is sensei teaching us how to put on a kimono! I loved this class and experience! 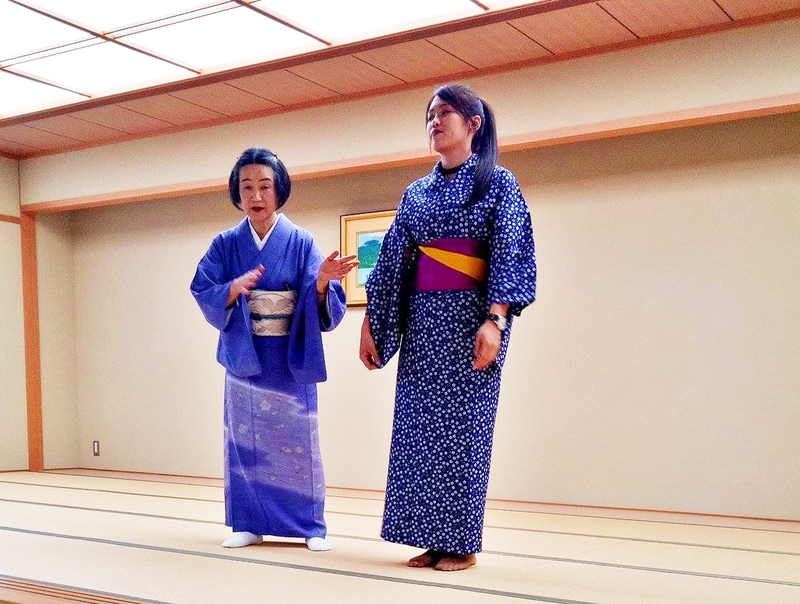 She also taught us the difference between a yukata and a kimono. That's Leo san! He is our class model. It was tight but it looked nice and its just wasn't something you get to wear everyday! This is my first time wearing a kimono guys!! Another happy group photo of us! 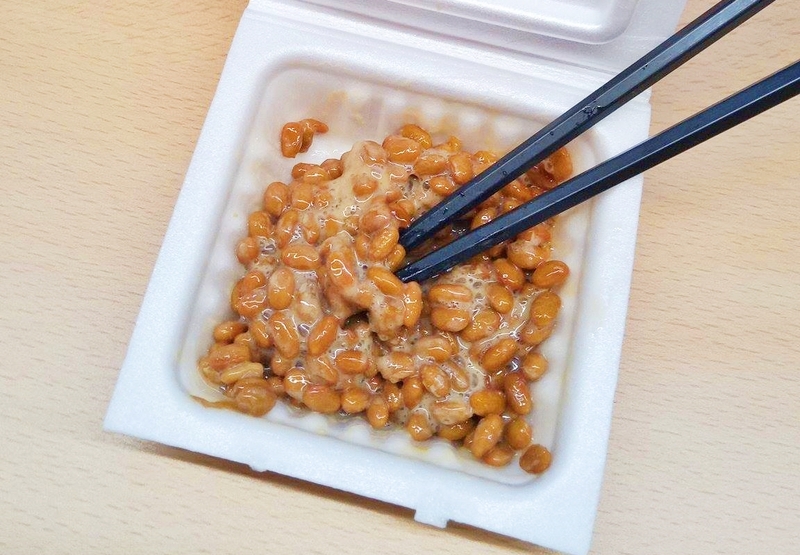 Super cheap natto from 7-Eleven every night in the dorm! It's only RM1 per box over there! T_T Cheap and satisfying meal. 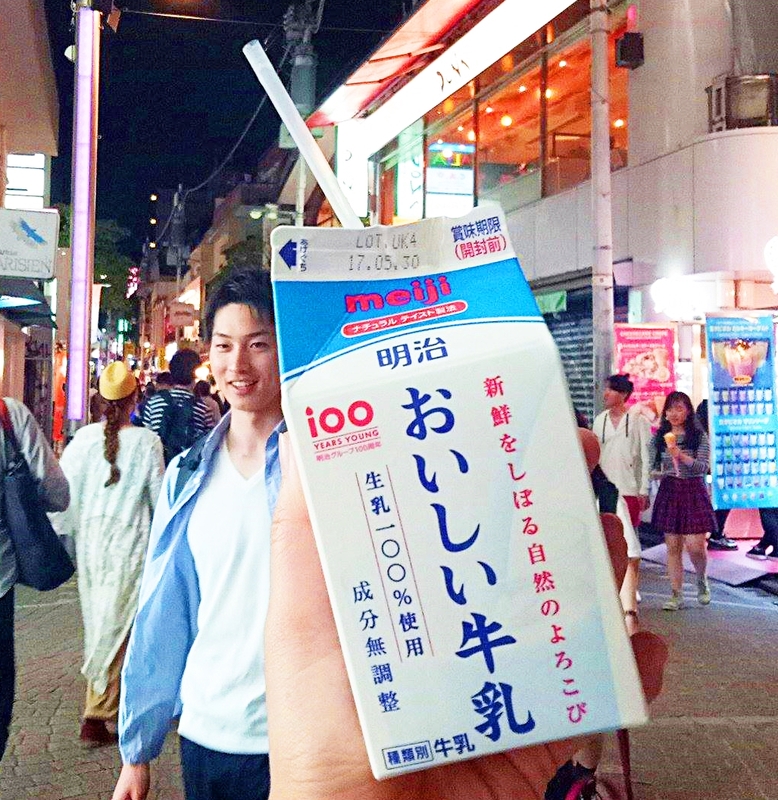 500 ml cartons of milk! This is sufficient to be taken as 1 meal on its own. So satisfying!!! This is Tokyo Fuji Art Museum. As a Soka University student, you do not have to pay for any entrance fee when you visit this museum. It is absolutely free. All you need to do is flash your student ID and you're good to go. #privileges As a Malaysian, it would be a disgrace to your parents if you had rejected anything that was free. Free? TAKE LEH! Although I'm not too sure of the things I was looking at when I was inside the museum. There was one day after class, we were feeling hungry and a little adventurous. Jiajia suggested that we went to this cheap sushi place, it was called Kura Sushi くらすし just around Hachioji. The bunch of them walked there together leaving me with an indecisive Euwern. It was a struggle to decide between eating sushi (have to walk) or 7-Eleven food again (just roll down the slope). Alas, we decided on Kura Sushi. But what we didn't know was how far the place was from where we were. It was a 2 km walk. It doesn't sound like much but the truth is that it is, especially when you're walking on an empty stomach. However, the weather that day was still cooling. It was a little scary simply because the place was so quiet and rural. We walked 2 km in silence. After the long cooling walk, we finally saw it! Why is this place famous? Is it cos its cheap? Its actually not that cheap. Is it cos of its lack of necessity of customer servicing? True, everything was just at our reach. Green tea powder and hot water at our table. No need to call for tea refill. You don't need the staffs to come and count your plates for you when you're done eating because this whole system where you place your empty plates into this slot counts everything for you. Everything is easy. You know what else? When you hit a 5 plate count, you get to play a game on the screen above. And if you win it, you win a gacha ball. Some motivation for you to eat more! Good marketing gimmick? Famous for their conveyor belt and convenience? I don't know. After dinner, we walked 2 km back to our dorm and I'm pretty sure we burned all that sushi away. I wish I'd live like that back in Malaysia too. Too bad it's too dangerous for girls to be out walking for 2 km at night even with a weapon in your pocket. I sound like I'm joking. During our last few days in Soka Uni and Hachioji, YunQi brought us girls to this small little Japanese house for dinner/supper as our last meal. I would never have imagined myself walking into such a local place on my own because it was bad enough there was a language barrier in the city, this is just making things easy for them and serving yourself on a plate. YunQi did all the talking and ordering for us girls. I'm not too sure what's the place called but it was also around a good 1 km walk from our dorm. I remember very clearly that it was our last night there because we were late and way past our dorm curfew yet again. It was our last night, late jiu late ba, one last time. The food was great but I have no idea what was I eating. On our last day, I bought this SOKA hoodie from Student Hall for RM120 and it was worth every yen!! So, I guess that was that. If I had to sum everything up, the experience I've gained just by being a student of Soka University was beyond what I would have imagined. Aside from our side trips to the city, I'm basing this feelings-segment just on my experience here in Hachioji and not Japan in general. I hope I can speak for everyone when I said that this was definitely a memory that all of us would treasure in our hearts dearly for as long as ever we can. Thank you UTAR and thank you SOKA Uni for giving us this opportunity to take up this course. To commemorate our final hours in the university, they ended the programme with a completion party. Each of us had to prepare a speech to present to our teachers and new friends to sum up our feelings and experience throughout the 11 days there. It wasn't mandatory, but our speech was encouraged to be in Japanese, most of it. It was great to see so many of us being able to construct a proper sentence. To think that it was only 11 days, imagine what we could do if we were to stay there for a month or two. There were tears and laughter. The banner looks exactly the same as the welcoming banner. 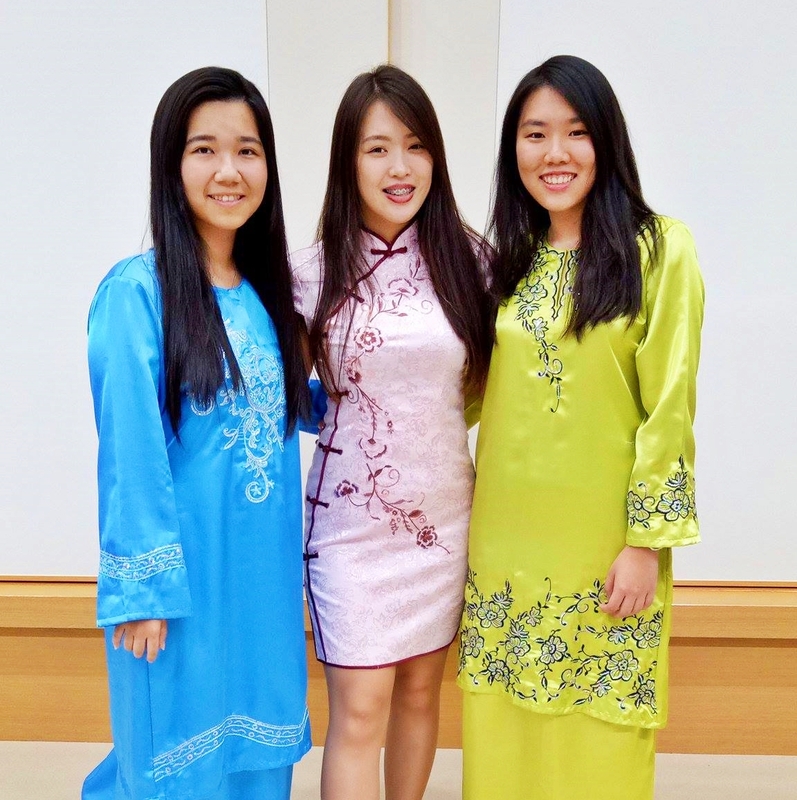 All the goodbye speeches revolved around requesting for us to share our experiences with our friends back home to encourage them to come over to Soka University for the exact study tour or maybe even to further their studies there. It was a very warm goodbye. Favourite Japanese teacher, Machida sensei. She made learning the language so easy and fun! And she loves to call out to Leo san! 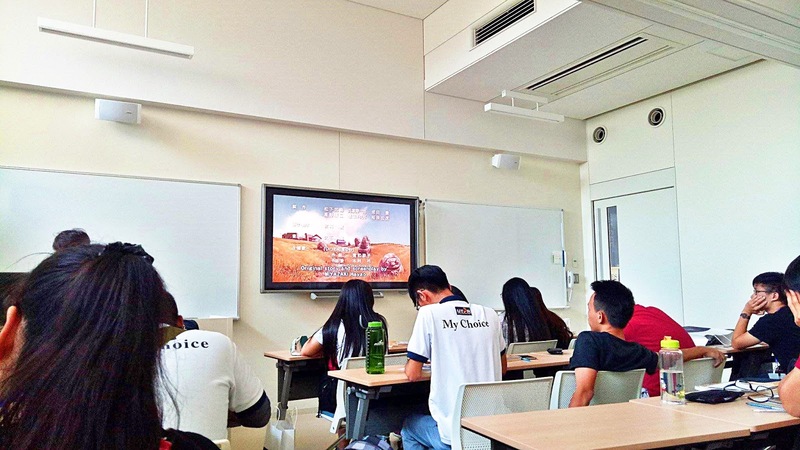 During our last class in Soka, Machida sensei let us watched Spirited Away while learning some phrases from the movie. After the class, she gave us all some candies from the movie! This was after each of us presented our speeches. We all got a completion certificate. That's Leo Yong on the right. His 水墨画 art is so impressive! He did it one night before the closing ceremony and presented to them as a token of our appreciation. He really did a great job! I'm feel so proud. I hope we'll have the chance to cross paths again some day. With my brother from another mother that I met and got comfortable with over there. How are you in Kampar right now, HongJie?! 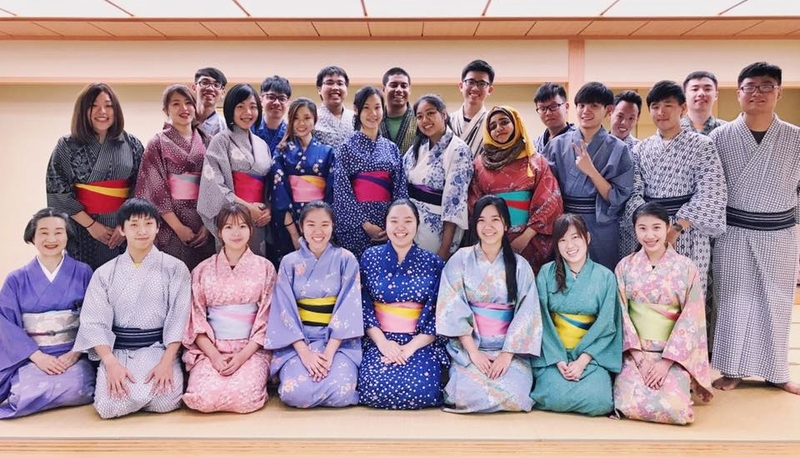 I also forgot to mention that UTAR urged us to put on our traditional wear during the closing ceremony. Hence, all the qipaos and baju kurungs. Ms Emily, HongJie, YunQi and Yuma! Group photo before we said goodbye! The study tour lasted 11 days only. However, Euwern, I and some other students extended our stay in Japan. On the day of our completion, the lot of us sat/slept on the bus from Soka to Narita airport to send our lovely friends off before we head on to explore the country. It was mandatory la actually, we must take the bus back to the airport. Well then guys, I guess that's that! I am so glad to have met and got the chance to get to know all these new friends from UTAR as well as SOKA before I graduate and leave university for good. Especially having the chance to get to know some friends from UTAR Kampar campus (see you when i graduate!). Thank you soka girls for teaching me so much more than I can learn. I hope to see you all soon! So, this was a lengthy post just about my study tour. 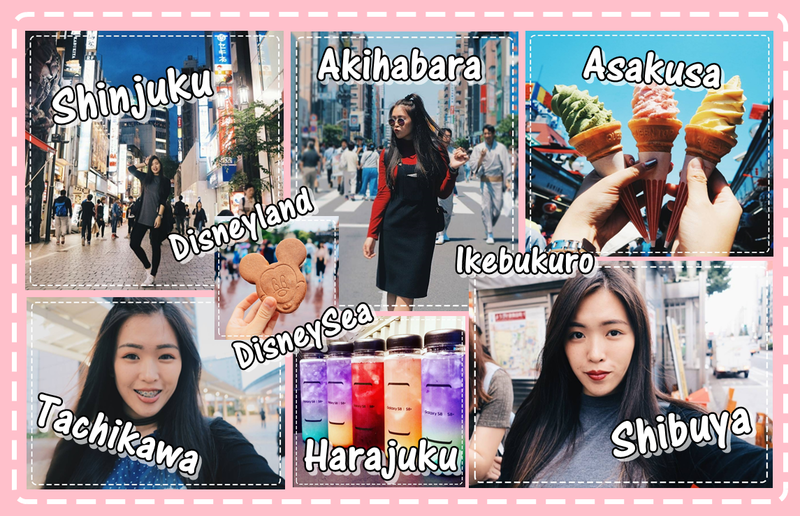 During our 2 weeks there, we managed to visit many places such as Shinjuku, Shibuya, Akihabara, Harajuku (went there 4 times in less than a week wtf), Asakusa, Tachikawa, Disneyland, DisneySea and the list goes on!! We spent over RM700 per person just on transport alone! It is crazy expensive to travel in Tokyo! 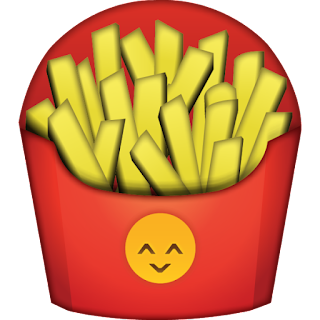 But anyway, that only means that I have so much more to blog about! Wait for mehh! If you're a UTAR student and you would like to know more about the study programme, what are the fees and so on, you can go to your campus' Department of Soft Skills Competency (DSSC) to ask for more information! Or you can comment down below and I'll get right to you! Looks like you had fun. After coming back from Japan, do you still know how to speak, read and write? Or are yous slowly forgetting? Wow, such a long posts, but it is awesome to travel Japan/ Soka U through your eyes/blog posts. Keep it up, JIAYOU!!! Thank you, my loyal reader! Hahaha. 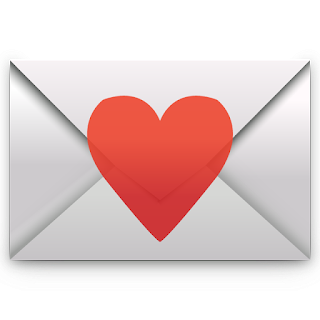 I hope you can continue to see what I see through my blog and Youtube! I do love your longform writing. Looking forward to the rest of your Japan updates! !